Chinese City Sets Up ‘No Cell Phone’ Pedestrian Lanes. Pedestrians in China can walk and text without bothering anybody with a new 100 foot "cellphone lane." Chinese pedestrians in Chongqing can walk and text in new cellphone sidewalks. The Chongqing phone lane mirrors bicycle lanes that separate vehicle lanes and bike lanes. 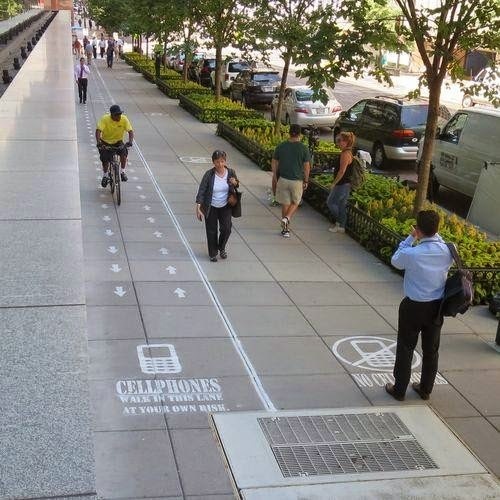 The mobile phone sidewalk is also similar to the lanes created on 18th Street in Washington, DC. These lanes were painted in July by the National Geographic TC channel for a crowd behavior experiment. But the experiment found that pedestrians in Washington, DC just ignored the lane. "Cell phones, walk in this lane at your own risk," a sign in one of the non-cellphone lanes in Chongqing reads. The adjacent lane separated by a white double line reads, "no cell phones." In 2012, Philadelphia, PA announced an "e-lane" for phone users that turned out to be an April fools joke. The prank was created to raise awareness on a serious public safety issue. The Chinese city may not be pranking pedestrians. Local officials reportedly made the cellphone lanes to remind people "it is best not to play with your phone while walking." 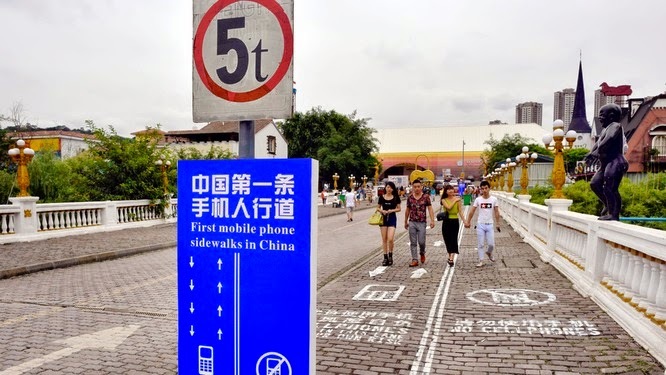 They also posted large signs announcing the "First mobile phone sidewalk in China," along with a diagram showing pedestrians how to use the street. But the new mobile lane probably won't be making major breakthroughs in urban safety seeing as it is located in a theme park and not a major city street in Chongqing. Recently, the U.S. has also made small efforts to address the public safety issue. The Utah Transit Authority can issue people a $50 fine for distracted walking in the cavity of trains. Distracted walking injuries in the U.S. are on the rise, since texting anytime, anywhere has become the new norm. 1,506 emergency room visits were recorded in 2010, compared to only 256 in 2005.